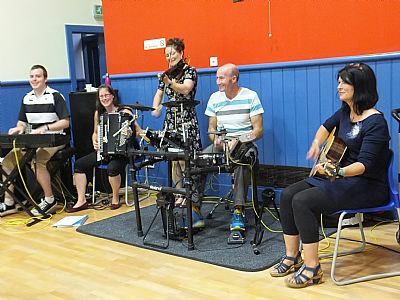 Every Monday evening you will hear the strains of live music coming from the St Magnus Centre on Palace Road in Kirkwall and the tapping of feet as the dancers follow the tutor for the evening as she/he gives the instructions. Supper is served at half time. Please check our events CALENDAR for our ongoing dance events held in Kirkwall. Kirkjuvagr Ceilidh Band - Left to Right - Lee, Tina, Dawn, Johnny & Kathleen. 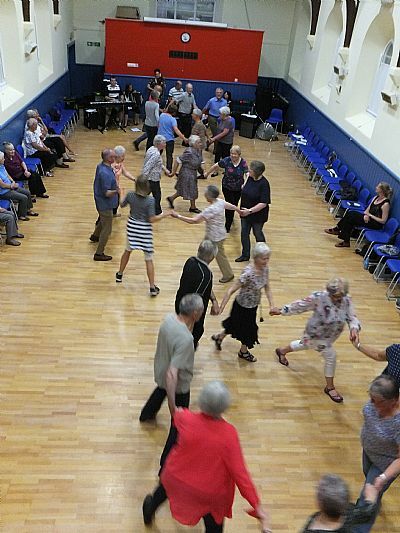 Dancing in St Magnus Centre – many tourists joined the regular dancing to enjoy the lively programme delivered expertly by Dawn Johnston. If you are on Hoy, Hoy Dancers also dance every Monday evening from September to April from 8 – 10pm with the help of CDs. £2.50 per Adults £1 per Child.